This is the first race where these five boats will be running together under the new parity rules. Snowy Mountain, the only 29' Outerlimits SVL yet built, will be running a different setup than in the past. Because of their back to back to back wins last season, they were given an equalization weight increase and instructed they must have the required data logger in place before they would be allowed to race again. Since they have not raced again after the parity equalizers were put in place, the guess out there is they have been tweaking and testing to make sure the increases in weight and decreases to the new RPM requirements are overcome to where the performance of their boat is minimized. Snowy, the reigning SBI World Champion, would certainly seem to be the favorite even with the parity restrictions. SBI Rulebook: ALL SUPERBOAT VEE CLASS ENGINES ARE REQUIRED TO HAVE THE STOCK IGNITION SYSTEM LIMITED TO 5800 RPMS AND HAVE A G2X DATA LOGGER INSTALLED and maintained to Monitor the RPM level during the race. The RPM level during the entire race must be verifiable on the Data Logger by the SBIP Inspector upon the completion of the Race, during the Post Race Inspection. NO DUEL SYSTEMS OR IGNITION COMPONENTS ARE ALOWED. Any boat competing in the Superboat Vee Class that exceeds the above listed MAXIMUM RPM LIMIT, as determined by the SBIP Inspector “WILL BE” awarded last place points and will not be eligible for trophies, flags, or prize money. This year's National Champion Absolutely Not, the newest Fountain 30' SVL built, is certainly expecting to have a good outing. Although they had a couple of major setbacks this season, perseverance paid off with the National Championship and they hope to add a World Championship to their trophy case. The boat may be named Absolutely Not, but it is an Absolutely beautiful raceboat! Another 30' Fountain, JD Byrider, will be hoping this is the race where everything comes together. They have had multiple issues this season and this could be the race where every gremlin has finally been eliminated. The boat itself has been a dominate world champion in its recent past, now the team has to keep pushing forward to get the boat back to those checkered flag days of yore. The reigning back-to-back OPA World Champion, Lilly Sport Boats, has combined their team and the Tug It team to campaign thier 29' Extreme as Hurricane of Awesomeness. This will be the second attempt to merge the talents of the two teams into one boat with the larger, and more modified, engine allowed in SBI. They are certainly a group that has a heck of a lot of fun, but don't let that fool you into thinking they are not serious about putting a checkered flag on their mantel, because they definitely are. If you want to see the difference between race face and fun face, try to catch them in the pits before Wednesday's race, then again at their party at Rick's Wednesday evening. 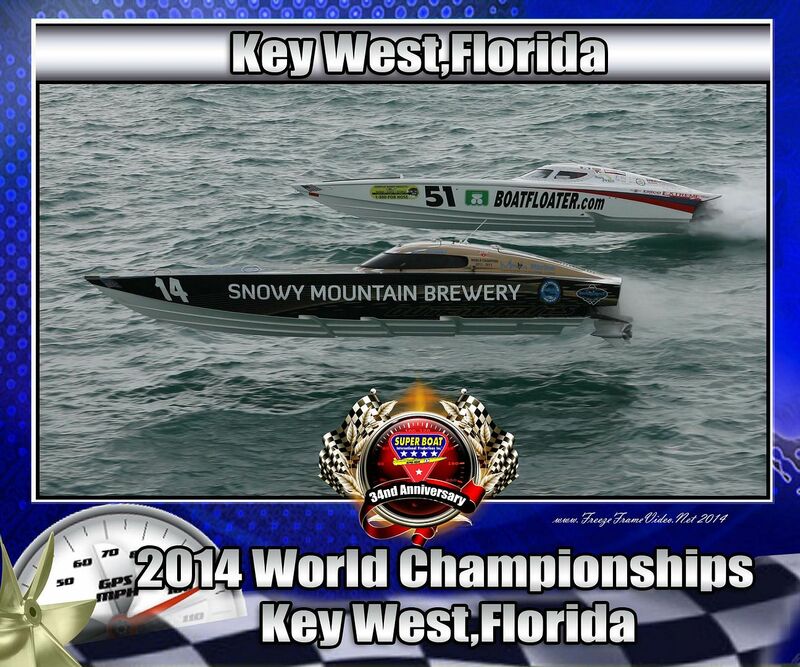 The last team believed to be racing this Championship is Sunprint/Boatfloater.com. Although they may have ended up last in our story, they are certainly not expected to be last in the race. Based on the experience of the team, this new boat with the latest expertise in bottom design from Extreme is sure to be in the thick of the competition. If they have the new-boat bugs all eliminated, a podium finish would be a pretty good place to bet your money. As explained at the beginning of this story the team has merged the talents of Sunprint and Boatfloater to campaign for this Championship, so the colors have been modified. The new Sunprint Extreme Above (Courtesy Pete Boden), Artist Rendering of Key West colors below. Make sure to keep your eyes on this very competitive class, there are no slugs in this group. There will be a lot of people paying attention to the class because of the parity rules, the data-logger RPM monitoring, and the new hulls competing against each other. Water conditions will play a key role due to the 29' and 30' length of the boats. It is always a good show with some serious air shots caught by the discerning photographers. Unofficially looks as if Snowy ran away with it as in the past. Evidently the parity rules implementation made no improvement in parity. Still trying to find out the status of the JD Byrider guys, the spin and flip appeared to be pretty violent. Prayers and fingers crossed. Early word is both guys are pretty much okay, one hurt though, but we're still waiting for official word. Boat is upright and towed in now. You can see the spin and flip on the broadcast, but the announcers weren't watching. They medevac'd Mike to Miami for observation, and Frank has a hurt arm, but is still in Key West according to the announcers at the start of the second race. They expect Mike back in Key West today, according to Frank. But, the boat is damaged too badly to get back in the event. Looking good before their mishap. Unofficially, Snowy Mountain first, Hurricane of Awesomeness second, and Boatfloater/Sun Print third. What a battle until Boatfloater broke.